You can easily sharpen swords, knives, (even serrated knives), cleavers, axes, machetes, and many other cutting tools. The large ergonomic handle fits either hand safely and securely. Most blades can be sharpened to have a razor edge after only a few passes with our Accusharp sharpener. The full length finger guard protects your fingers. Sharpening blades are Diamond Honed Tungsten Carbide and provide years of reliable use. Our knife, tool and scissor sharpeners will not rust and can be cleaned with soap and water, or in the dishwasher. To use, place knife on table or counter top with the cutting edge up and with about 1/2" of the blade tip extending past the edge of the table as shown in the illustration. While holding the knife handle with one hand, hold the AccuSharp as shown with your fingers through the opening formed by the handle and the finger guard. REMEMBER: THE SHARPENER MOVES WHILE THE TOOL BEING SHARPENED REMAINS STATIONERY. Straddle the knife"s cutting edge near the handle of the knife with the "œV" notch formed in the sharpener. With the head of the AccuSharp at about a 90Â° angle to the knife"s edge press down LIGHTLY using thumb pressure and draw the AccuSharp past the point of the blade. You will feel the tungsten carbide sharpeners removing metal from the knife. Several passes in this manner may be required before your knife"s cutting angle conforms to the proper angle of AccuSharp. Once that angle is achieved then two or three passes should be sufficient to bring your knife back to a sharp edge. REMEMBER: LIGHT PRESSURE IS SUFFICIENT. Heavy pressure might cause you to lose control of the knife and possibly cause injury. The tungsten carbide sharpeners of AccuSharp are of high grade industrial quality and are one of the hardest materials known. Even so, after several years of use, they may become worn. Due to their unique design the sharpeners can be reversed for double life. To reverse the sharpeners lay the AccuSharp on its side with the screws up. Remove the screws and carefully separate the two halves of the handle as shown in the following illustration. The sharpeners should remain in the lower half. Simply switch the position of the sharpeners (front sharpener to rear and rear sharpener to front) taking care to keep the reference dot (n) on the sharpeners facing toward the tail end of the handle. If the finger guard becomes disengaged during this operation, secure both ends of it in the slots provided prior to reassembly. CAUTION: DO NOT REASSEMBLE THE KNIFE SHARPENER WITHOUT THE FINGER GUARD. SERIOUS INJURY MAY RESULT. Reassemble the two halves of the handle and secure with the three screws. DO NOT OVER TIGHTEN SCREWS. The factory torque setting is about 5 inch pounds of pressure. Tighten them only until you feel increased resistance. If sharpener has any cracks around the screw heads do not use it. Either discard the sharpener or return it under the terms of the warranty. 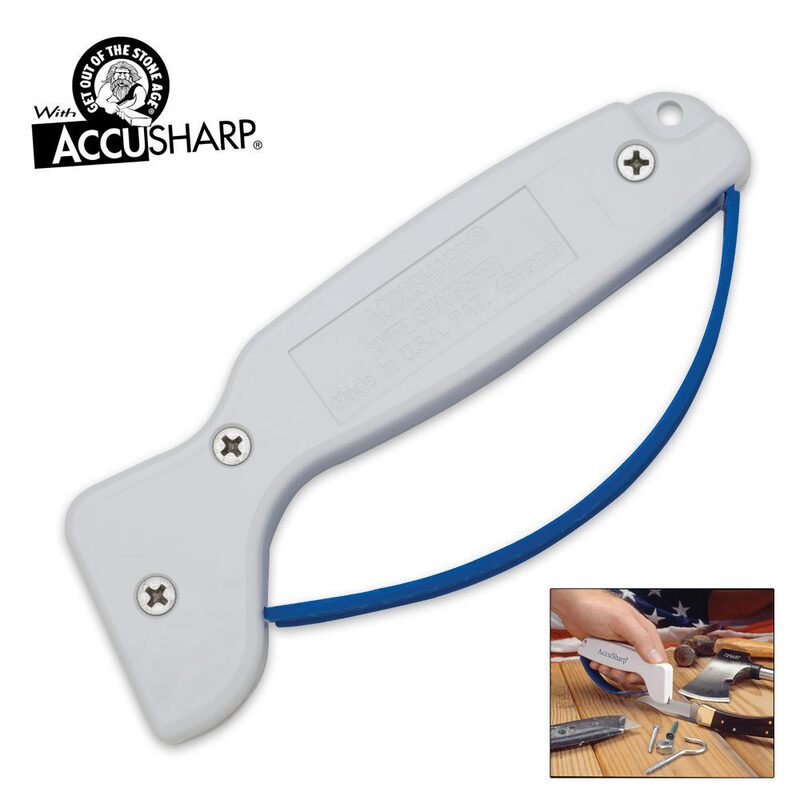 AccuSharp is perfectly safe when used properly. Also available, Accusharp Knife Sharpener Replacement Blades.